Bacon & Brine burger by Tenley Fohl Photography. 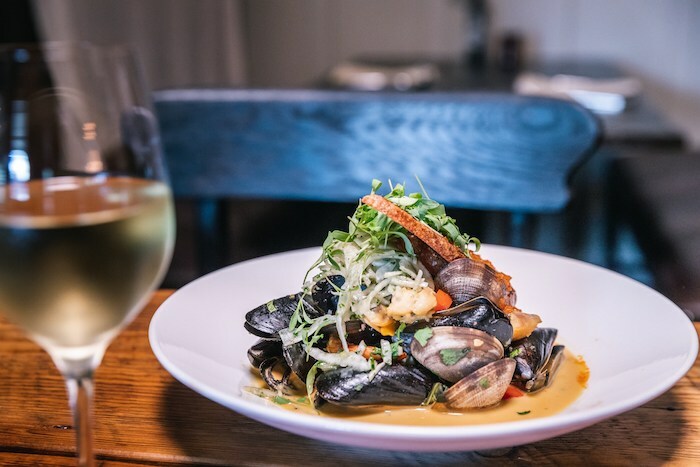 From refined ranch cooking to gourmet burgers and creative couplings of unexpected ingredients to upscale wine country cuisine, the Santa Ynez Valley has a host of terrific new places to dine out and indulge in this summer. “The Kitchen” at FigMtnBrew is now open and, as Executive Chef Brian Champlin vows, this place definitely has, as he modestly states, “under-promised and over-delivered!” The eatery now offers a full menu of beer-friendly gastropub fare such as creative burgers, fried chicken sandwiches, tacos, salads and more. Our group particularly loved the 21+ and over grilled cheese, Davy Brown nachos and chorizo cheese fries—but honestly, everything that came out of the kitchen was delicious, especially paired with craft beers like Fig Mtn Mosaic and Paradise Rd. Pilsner. Jeff Hawxhurst, left, and Brian Champlin of The Kitchen at FigMtnBrew, courtesy photo. The Bear and Star (a nod to patriarch Fess Parker’s California and Texas roots) gets its culinary inspiration from the 714-acre Fess Parker Home Ranch located seven miles away, where 75 head of Wagyu cattle are raised and finished with the spent grains and pomace from the family brewery and winery, along with chickens, quail, rabbits, pigs, bees and a number of heirloom fruits and organic vegetables. The Bear and Star by Kodiak Greenwood. This impressive ecosystem was developed under Chef/Partner John Cox’s passion and vision. Also integral to the restaurant is a 30’ custom reverse-flow Texas smoker that he specially designed for slow smoking and barbecuing many of the dishes. Cox, formerly with Sierra Mar at Big Sur’s renowned Post Ranch Inn, has created an inventive ranch-inspired menu offering lunch and dinner items like Wagyu Fries with garden herb aioli; deviled ranch eggs with Santa Barbara urchin and espelette; fried green tomatoes with “cheese wiz” and BBQ spice; Parker Ranch Wagyu burger with smoked cheddar, tomato jam and butter pickles; crispy catfish with re-fried black-eyed-peas and “blackened” smoked tomato sauce; Wagyu meat loaf with potato puree, garden vegetables and pan jus; Parker Ranch chile with cheddar, chives and cornbread crouton; local stuffed quail with farro risotto, bay laurel and red wine demi glace; and an array of steaks, ribeyes and filets, among other items. Highlights for breakfast are dishes of cheddar biscuit and country gravy; steel cut oatmeal brûlée with local blueberries and caramelized palm sugar; and smoked Wagyu hash with farm eggs, root vegetables and lemon-thyme hollandaise. wine-walled private dining room. The Bear and Star, Fess Parker’s Wine Country Inn, 2860 Grand Ave., Los Olivos, 805/686-1359, thebearandstar.com. Already offering one of the most unique wine-tasting experiences in California—with its expansive “Wine Wall” of 52 constantly changing wines available by the taste, half glass or full glass—the new Bottlest Winery Bar & Bistro has stepped up its cuisine tremendously, with a new restaurant concept from Executive Chef Owen Hanavan, the former Head Chef of Barbareño, whose culinary résumé includes time spent at Four Seasons Resort The Biltmore Santa Barbara and the Michelin-starred COI Restaurant in San Francisco. 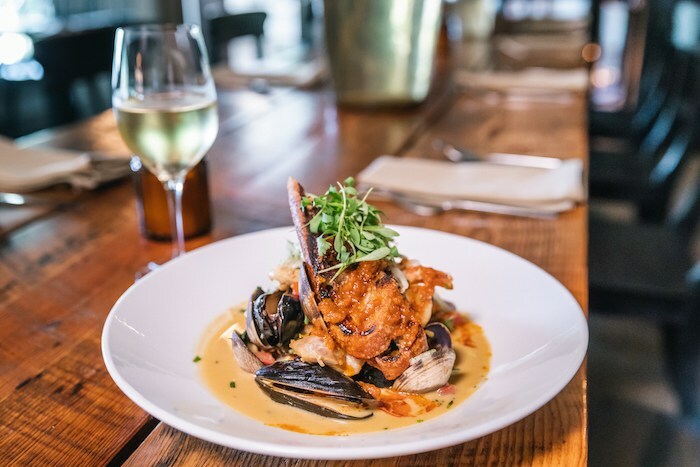 Utilizing a bounty of locally sourced organic produce, meats and fish, a recent sampling of Chef Owen’s creations was so delicious that it’s hard to name a favorite dish. Definitely high on my list are the beautifully plated “Sixteen Spiced Pork Shoulder” (with almond rice pilaf, date glaze, romanesco broccoli and lemon oil), melt-in-your-mouth New York strip (with sousbise, duck fat potato, chimichurri and crispy leeks) and yellowtail (with poached tuna, rice cracker, nori vinaigrette and micro cilantro). 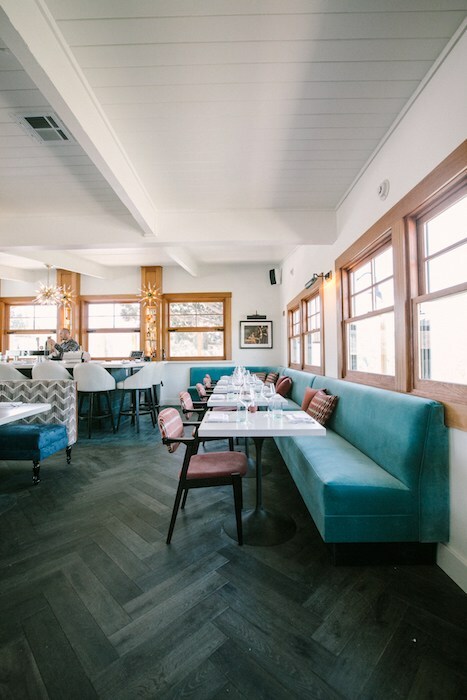 In addition to the elevated evening cuisine, the lunch and midday menus include a variety of small plates (the lamb meatballs on housemade potato chips are divine), as well as sandwiches, salads and pizzas sure to please every palate. 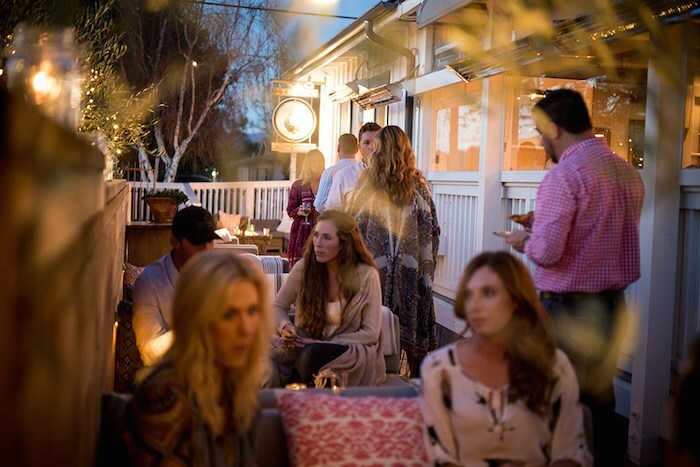 Bottlest Winery Bar & Bistro, photo by Bottle Branding. Hyper local culinary entrepreneurs Chef Pink and Courtney Rae DeLongpré’s Bacon & Brine sits at the top of the ever-evolving Santa Ynez Valley food chain. 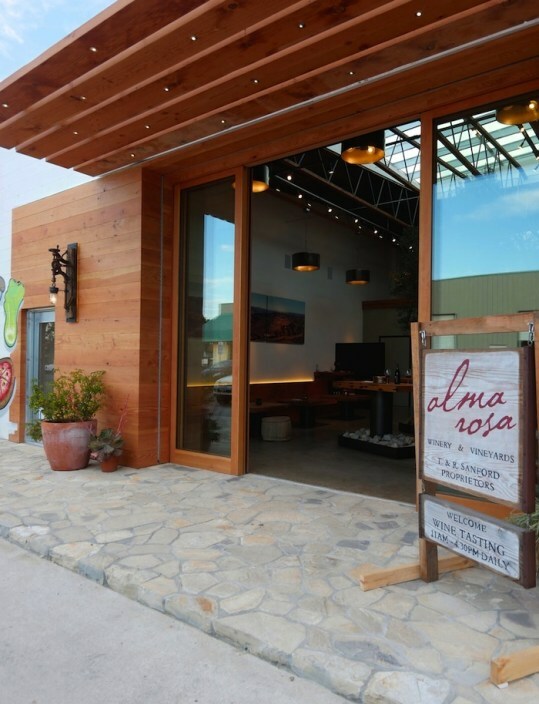 This delicious addition to the Solvang scene opened last summer to eager fans and customers of the duo’s previous sandwich shop. 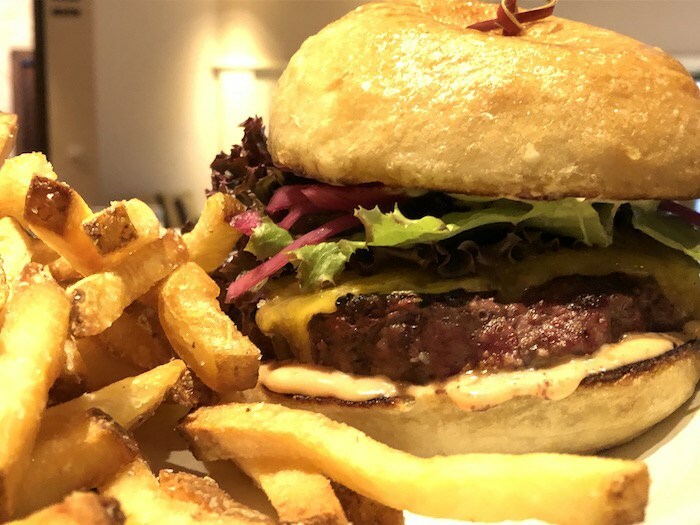 With guidance from Chef Pink, we ate our way through much of the menu, an impressive gastronomic collection of delights that evidence the couple’s full commitment to utilizing local organic vegetables and organic grass-fed pasture-raised animals. In fact, none of their food items come from more than 10 miles away, except spices and seasonings, which are all fair-trade. Bacon & Brine by Tenley Fohl Photography. Beef, chicken and vegetarian options mingle with the pork menu items (all of the cattle and poultry come from Shadow Creek Ranch, a small Santa Ynez Valley farm), but the flavors are even more impressive than the menu’s provenance. Our favorites include Korean Fried Chicken (KFC), “The Hipster” sandwich (buttermilk fried chicken, shredded lettuce, pickle and aioli on a doughnut bun), the kimchi burger (wagyu beef, bacon, housemade “legit” kimchi, farm egg, chives and bacon aioli), fried Brussels sprouts, roasted beets and the to-die-for salted caramel bacon doughnuts. Chef Pink, the “bacon” half of this business, is a 17-year food and restaurant industry veteran who has worked with California chefs and restaurants stretching from Los Angeles to San Francisco, as well as in New York and Paris kitchens. She’s also a bit of TV food celebrity, appearing on Spike TV’s Bar Rescue, Food Network’s Cutthroat Kitchen and FYI’s Man vs. Child. The “brine” half of “Bacon & Brine” is Courtney Rae DeLongpré, a proponent of healthy eating with a passion for food, nutrition and small-scale homesteading, which led to her studies of traditional old-world food preparations, segueing to her fermentation craft. “We want to share with the surrounding community our personal mix: fine dining techniques using local ingredients and our use of fermentation to create flavor profiles, which let those ingredients shine,” says Chef Pink. “I’m meshing my years of training as a proper chef, with our philosophies of hyper-local organic, whole, sustainable food systems…and my love of, and allegiance to, a great food experience that’s accessible to everyone.” Bacon & Brine, 1618 Copenhagen Dr., Solvang, 805/688-8809, baconandbrine.com. Hours vary by season.